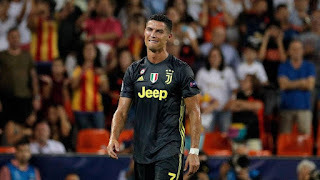 Juventus star, Cristiano Ronaldo will be available to face his former club, Manchester United, in the Champions League next month after being handed a one-match ban by UEFA for his red card against Valencia. The Portuguese captain left the field in tears at his debut in the competition for Juve. UEFA confirmed that the 33-year-old will be suspended for only a single game against Young Boys in Turin after its Control, Ethics and Disciplinary Board (CEDB) decided not to increase the automatic penalty at a meeting on Thursday. “The CEDB has decided to suspend the Juventus player Cristiano Ronaldo for one Uefa competition match for which he would be otherwise eligible,” read a statement on UEFA’s official website.